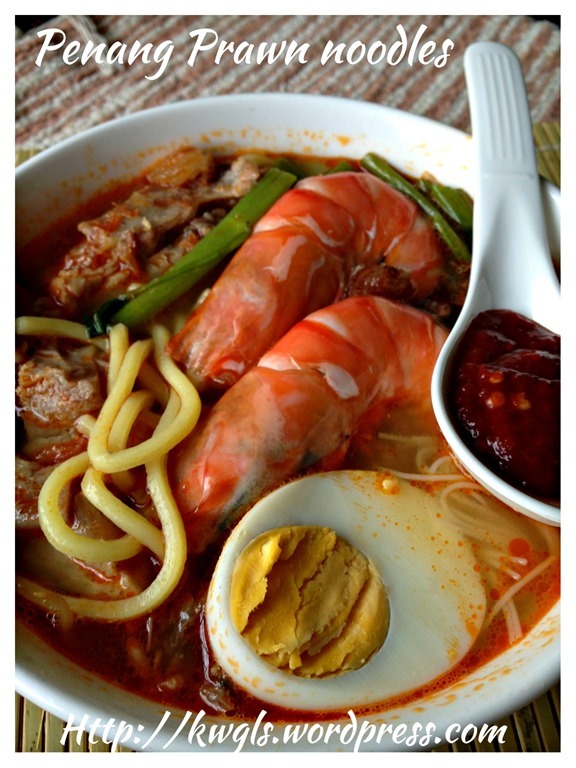 I have been to Penang in Northern Peninsular Malaysia a few times but I had never tried the Penang Hokkien Prawn Mee there. 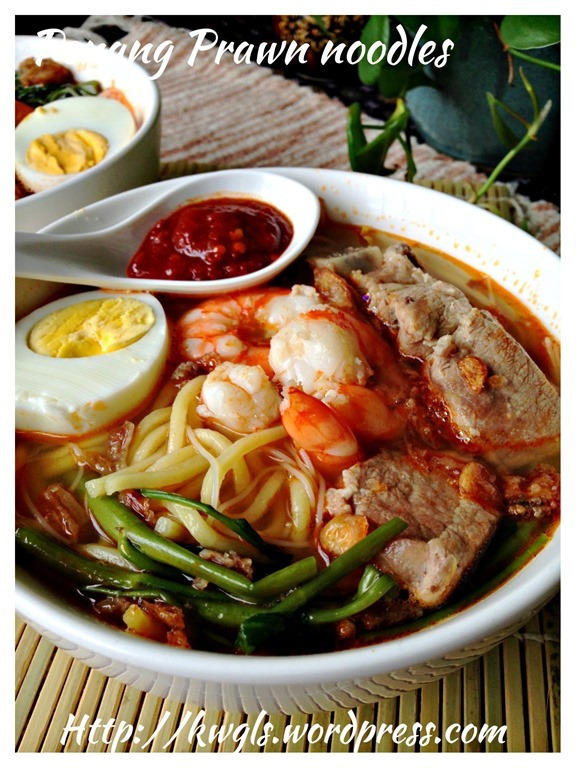 But I do love the one that is sold in Singapore hawker centre..
As compared to other one pot noodle dish, preparation is rather simple but time consuming as you need time to “extract” out the “essence” from the prawns and pork ribs. 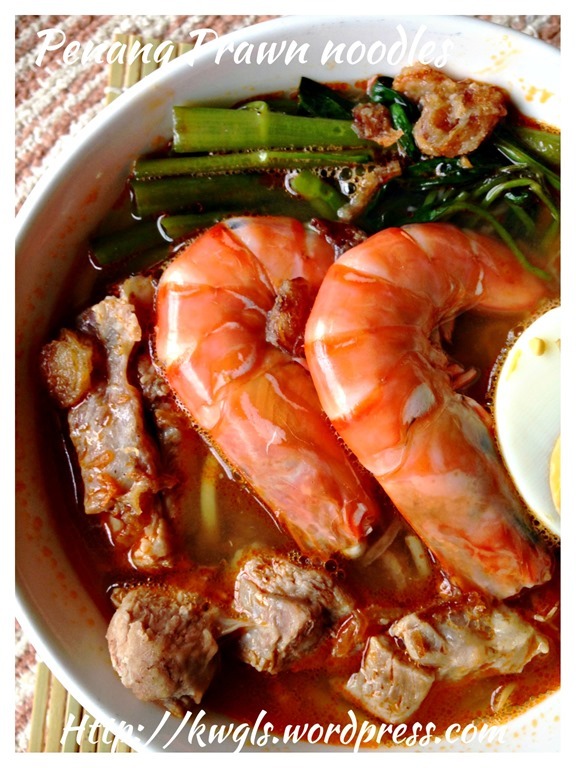 For the stock, there are many optional ingredients you can add some: dry prawns, chicken bones, anchovies, Mexican turnip or bangkwang, soya beans to make it into a rich and flavourful stock. In a pot, put about 2 cups of water, boiled the pork ribs under the pork ribs are soft and tender. Once done, drain the pork ribs and keep the meat stock. Meanwhile, in another pot, put about 2 cups of water, bring to boil, blanch the prawns for about 3-5 minutes. Drained and set aside. 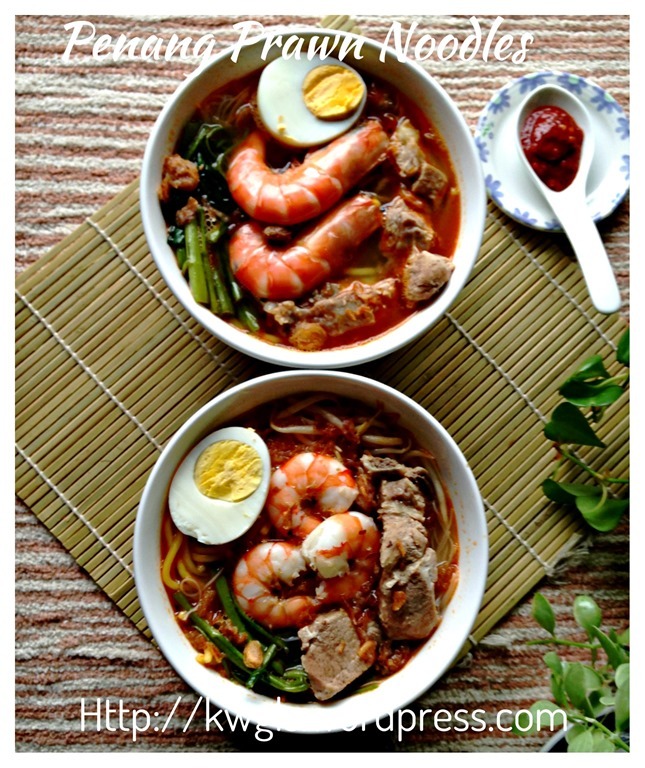 Keep the prawn stock. In a frying pan, put the cooking oil, sauté the ginger and sliced shallots until fragrant. 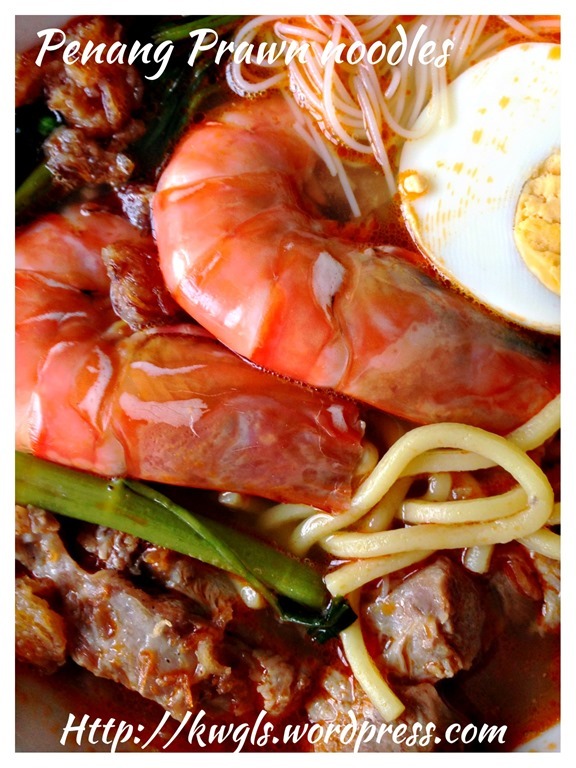 Add the prawn shells and prawn heads. 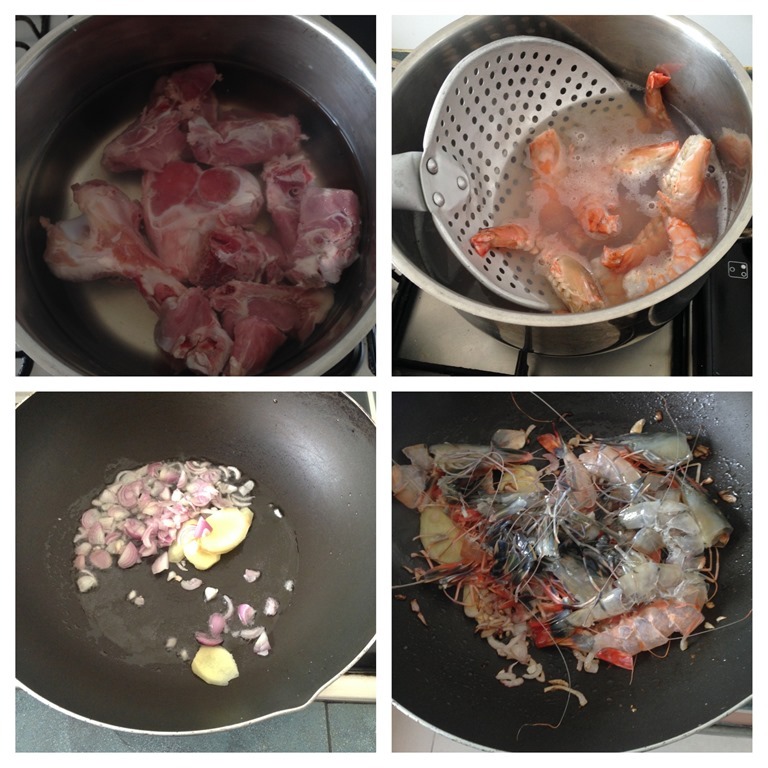 Stir fried until the colour changes and aroma of cooked prawns started to permeates the house. This step can be optional. 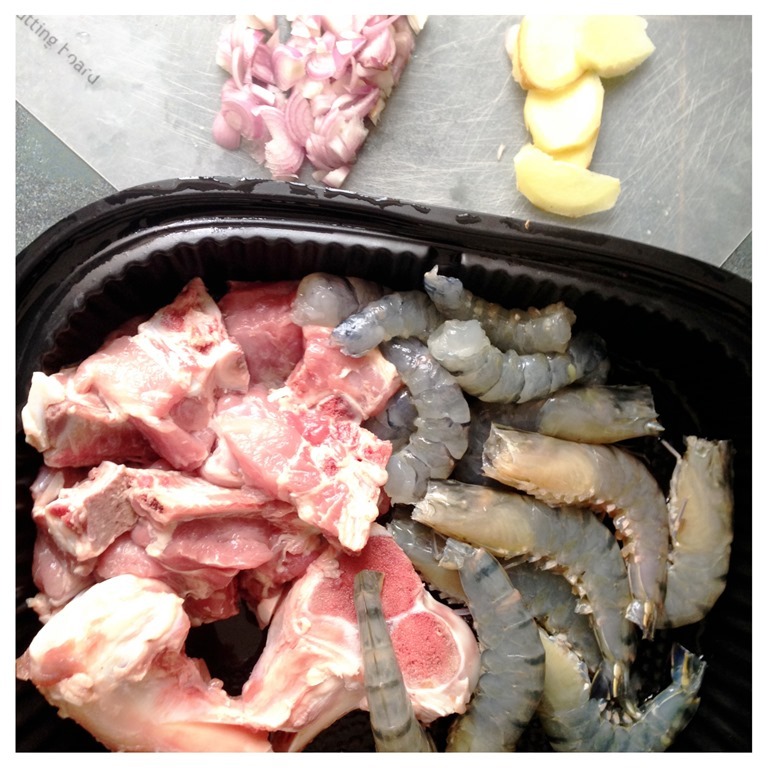 However, as I personally do not like the fishy prawn smell, I usually cooked the prawn shells and head for the stock preparation. The stir frying shall take 1-2 minutes. 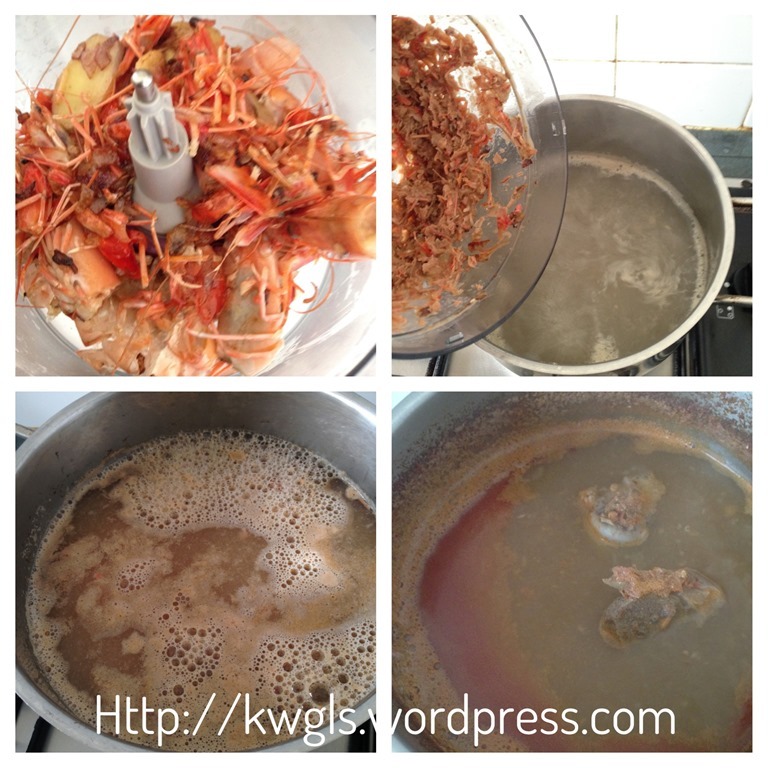 Transfer the cooked prawn heads and shells to a food processor, blend until as fine as possible. Transfer the blended shell and heads to the prawn stocks earlier. 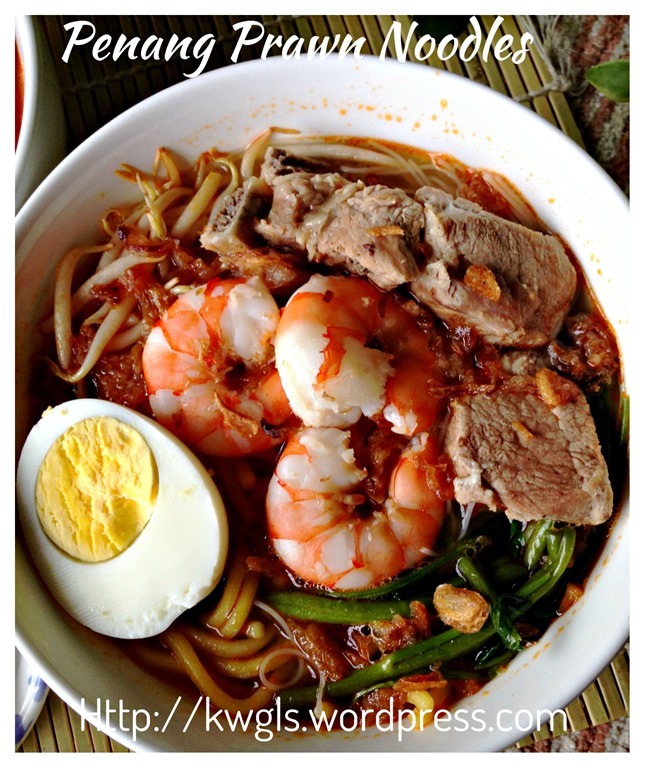 Boiled for at least half an hour under medium or low heat.. If the water is getting low, add in more water. 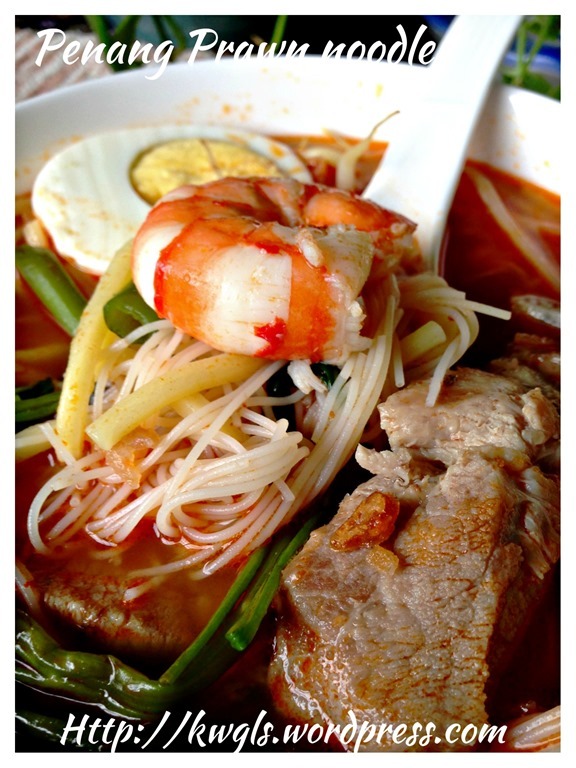 The purpose of blending is to facilitate the extraction of prawn stocks from the prawn shells and heads. You can also add the chilli sauce at this stage for some spiciness and colour. 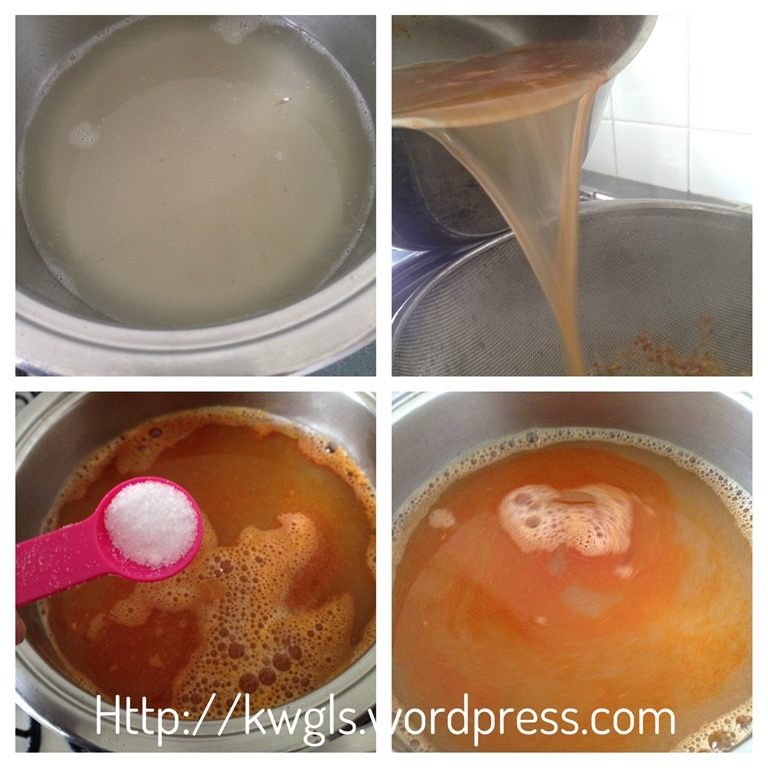 Once the prawn stock is done, sieve the prawn stock to the pot that contain the meat stock. Bring to boil, add seasonings (salt, sugar and dashes or white pepper) . Off the heat and set aside for assembly. 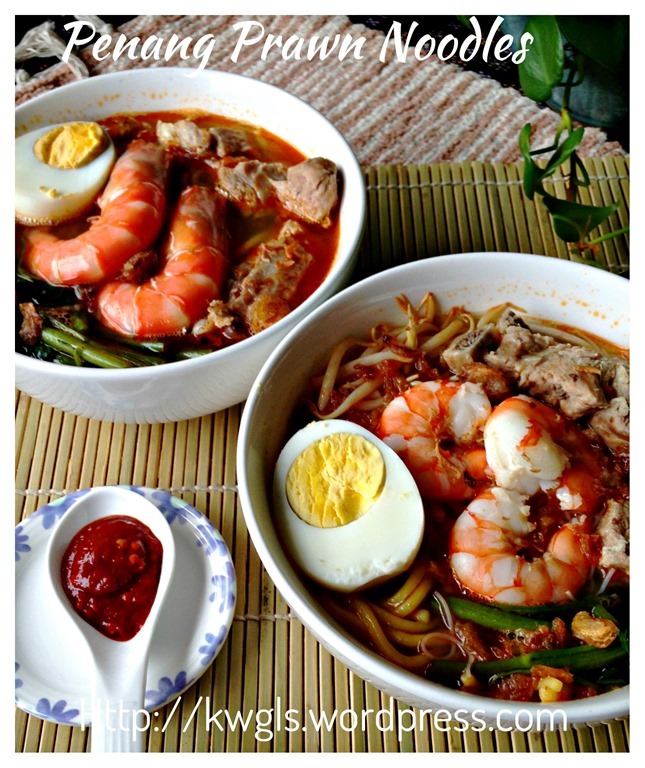 For assembly, you should have the following ingredients ready: hard boiled eggs, pork ribs, prawns, deep fried shallots, blanched yellow noodles, blanched rice vermicelli, blanched water spinach, blanched bean sprouts, sliced fish cake and some home made chilli sauce or red cut chilli dip in light soya sauce. 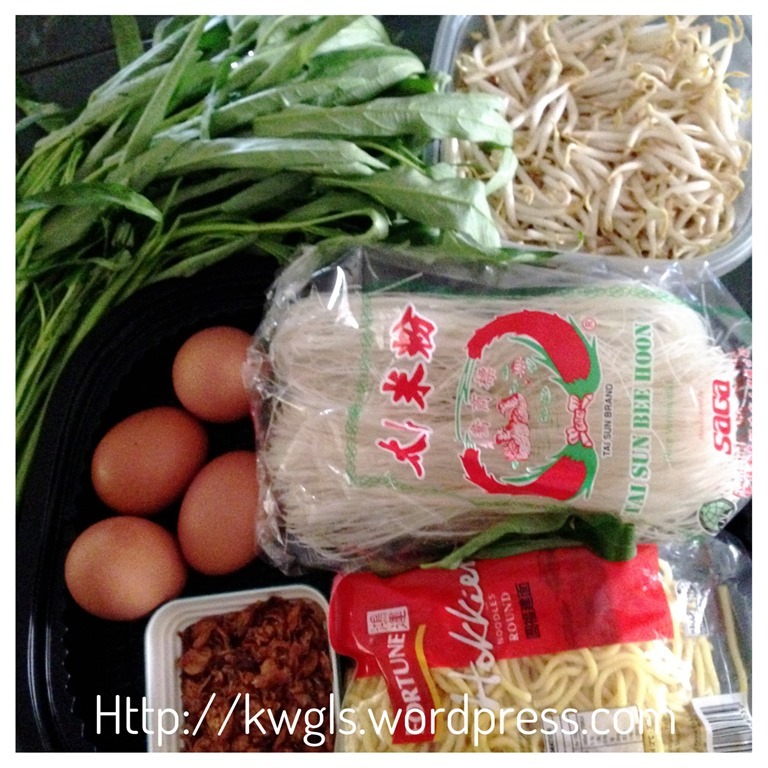 In a bowl, have some yellow noodles, rice vermicelli, bean sprouts and water spinach. 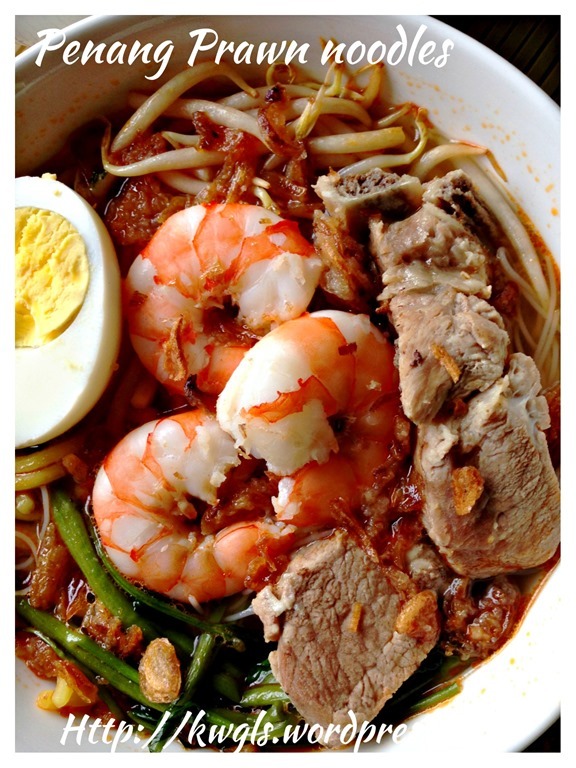 Put prawn stock until it adequately covered the noodles. 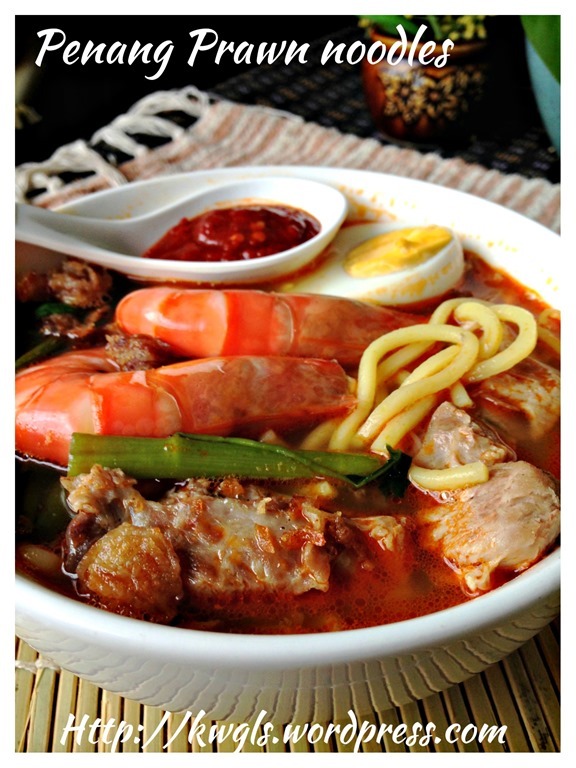 On top of the noodles, put some prawns, hard boiled eggs, sliced fish cake and pork ribs. Sprinkled generously with deep fried shallots and best served with homemade chilli sauce or red cut chilli dip in light soya sauce. 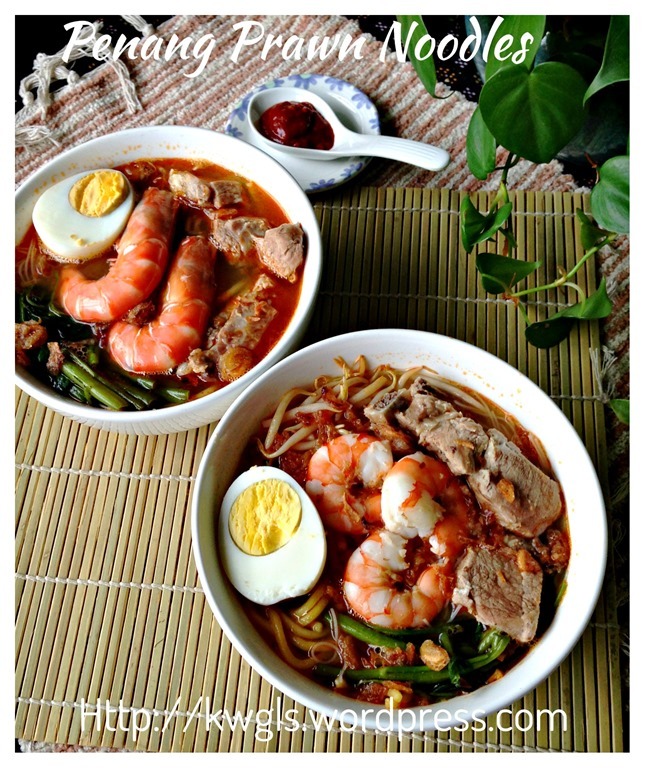 For more recipes, you can refer to my RECIPE INDEX (updated as at 15 October 2014) here and you can follow me at PINTEREST or visit the blog’s FACEBOOK PAGE to keep abreast of my future posts. 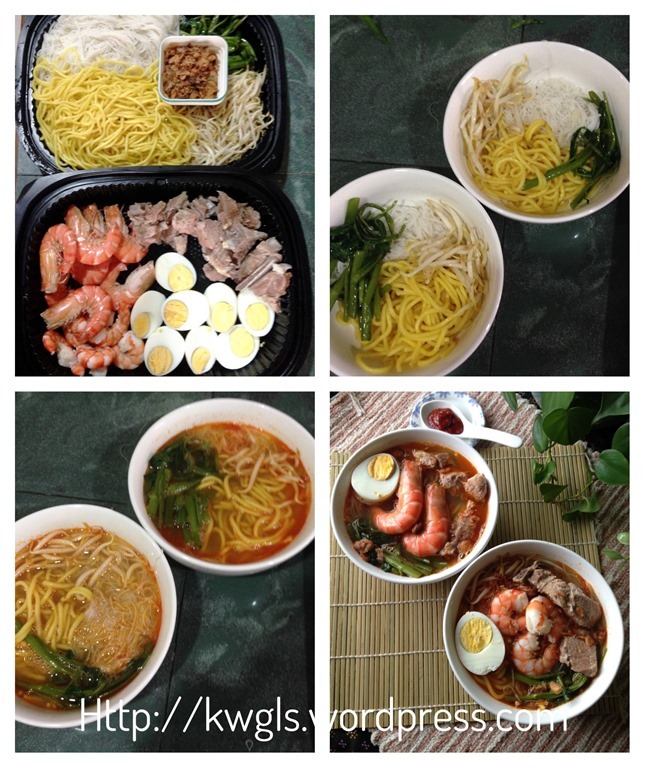 This entry was posted in Food Preparation Series, Noodles, Rice and Others and tagged 8, GUAI SHU SHU, Guaishushu, hokkien noodles, kenneth goh, penang hokkien noodles, penang prawn noodles, postaday, prawn noodles, 槟城福建虾面. Bookmark the permalink. 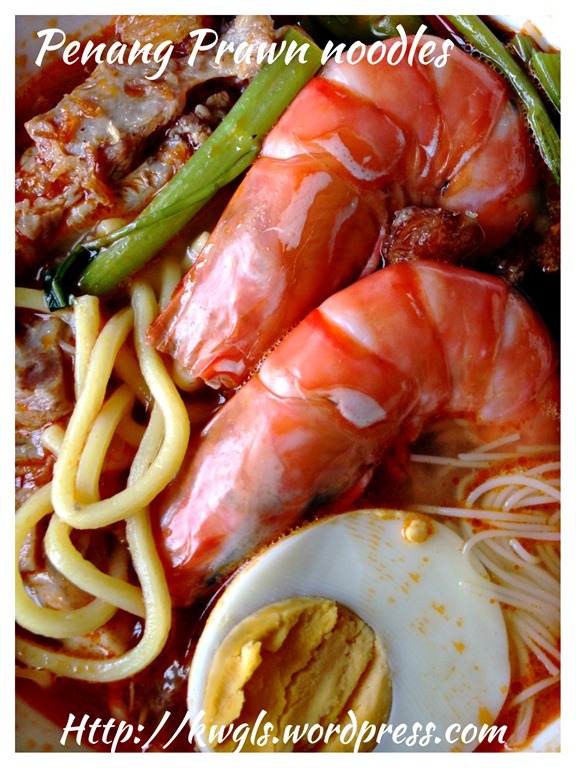 Just ok with Penang Hokkien prawn noodles – nice, I had some very very nice ones, even here in Sibu – one very good stall, but not something I’d go out of my way for. Yours certainly look a whole lot nicer though but of course, the test of the pudding is in the eating. 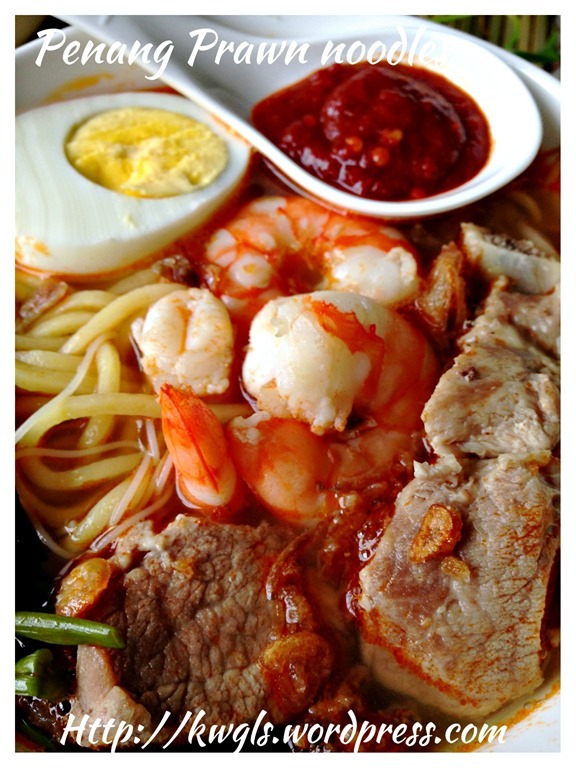 Between the two, I’d prefer the Singapore fried Hokkien (prawn) mee – usually served/wrapped in some kind fo dried leaf, right? That was in the early 70’s. Do they still do that?